Powerful stimulant of the body's natural defenses, Finessence Organic Clove Bud Essential oil boosts the immune system. Ideal in case of physical and mental fatigue. Antibacterial, it is recommended for viral infections (bronchitis, sinusitis ...) and intestinal (diarrhea, colitis ...). In aromatherapy, it is known to relieve dental pain such as toothache and cavities. It also helps maintain good oral hygiene. In atmospheric diffusion, it purifies the air of your interior and creates a spicy atmosphere thanks to its hot and spicy smell. 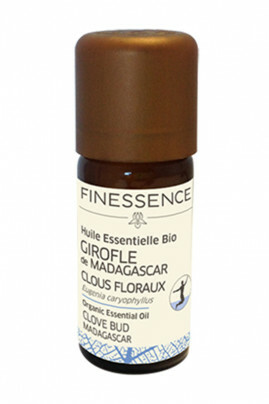 A true natural care of the mouth, the Finessence Organic Clove Bud Essential oil is essential in case of toothache. In cosmetics : Powerful, it is used very diluted up to 4 drops of essential oil for 1 teaspoon of vegetable oil. Atmospheric diffusion: Purify your interior by adding a few drops of essential oil in your diffuser. Refer to your device manual for dosing and diffusion time. An essential oil 100% organic! Eugenia caryophyllus (clove) bud oil, eugenol*. Contains: eugenol. May cause an allergic skin reaction. Cause serious eye irritation. May be fatal if swallowed and enters airways.